Satya Nov 06: Turkeys: Who are They? by Karen Davis, Ph. 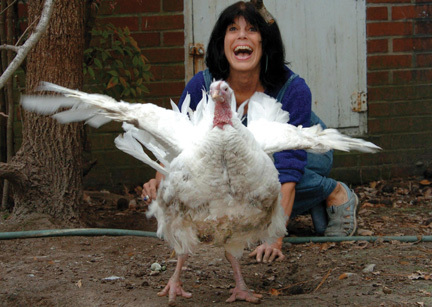 D.
My first encounter with turkeys took place at Farm Sanctuary where I worked as a volunteer one summer. There was a flock of about 20 white turkey hens and two bronze turkeys named Milton and Doris. One thing that impressed me then, and has stayed in my mind ever since, was how the turkeys’ voices—their yelps—floated about the place in an infinitely plaintive refrain. Another was how one or more of the female turkeys would suddenly sit down beside me in the midst of my work, with her wings stiff and her head held high, awaiting my attention. Doris wandered about the farmyard all day by herself like an eternal embodiment of a “lost call,” the call of a lost young turkey for her mother. Milton would follow us around on his gouty legs and swollen feet. His dark eyes watched us from inside a bristling armor of iridescent brown feathers and pendant, heavily wrinkled pouches of head and facial skin of varying colors reflecting emotions that made me think of a body with its soul imprisoned deep inside. Milton plodded behind people, stopping when they stopped, resuming his ponderous tread as they did. He would often stand before you, or appear unexpectedly at your back—manifesting himself almost scarily at times—decked out in his full array, his tail in a fabulous wheel, his wing ends dragging stiffly. Like the hens in their starched, white wing skirts, crouched exactly where you shoveled the muck, he awaited your response. To understand the complex suffering of turkeys raised for food, one should begin by knowing that in nature, young turkeys stay close to their mothers for four or five months after hatching. Turkeys raised for food, however, never see their mothers. Biologist William M. Healy has described the importance of bonding between young turkeys and their mothers for normal social development. He notes that much of what biologists know about wild turkey intelligence is based on work with domestic turkeys. He defends turkeys from the charge of stupidity by observing that genetic manipulation of turkeys for “such gross breast development that few adult males can even walk, let alone breed” creates demeaning stereotypes. I know from experience that turkeys who have lived their entire lives in industry settings can still roam the woods and find their way back to the yard as soon as they get to our sanctuary. Despite the terrible things that have been done to their bodies—the gruesome genetics and mutilation of their toes and beaks at the hatchery—factory farm turkeys are alert to their surroundings and one another. Several times I remember seeing our peacemaking turkey Mila stop her testy companion Priscilla from charging a person by inserting herself between Priscilla and her target. And I have seen how well turkeys get along with people and with other birds at our sanctuary. Though for reasons I never figured out, our turkey Florence, who died last March after living with us for seven happy years, would occasionally get mad at one of the ducks, snood her nose down at him, and chase him off. I heard a flock of wild turkeys calling. They were not calling strayed members of the flock. They were just having a twilight frolic before going to roost. They kept dashing at one another in mock anger, stridently calling all the while, almost playing leapfrog in their antics. Their notes were bold and clear. For about five minutes they played on the brown pine-straw floor of the forest, then as if at a signal, they assumed a sudden stealth and stole off in the glimmering shadows. An emotional behavior described in turkeys is “the great wake they will hold over a fallen companion.” In The Wild Turkey: Its History and Domestication, A.W. Schorger cites an episode in which the wing beats of a turkey hen who had been shot “brought a flock that stopped beside the dying bird.” Similar behavior has been observed in turkeys on factory farms when a bird goes into a convulsive heart attack. “It is not uncommon to go into a bird house and see the afflicted bird lying dead, surrounded by three or four other birds that died because of the hysteria caused,” wrote a poultry researcher. Such “hysteria” reveals a sensibility in turkeys that should awaken us to how badly we treat them and make us stop. I saw a turkey coming into the back field. She had about 10 babies the size of large quail walking with her. Without warning, the hen took off vertically as if she had stepped on a mine. About 20 feet off the ground, she intercepted and attacked a hawk that was coming in for a baby. The hen hit the hawk with her feet first and with her back almost parallel to the ground. The hawk flew toward the back of the field with the hen in pursuit; it turned back towards the babies, and the hen hit it again. They both fell about 10 feet and were fighting with their feet, until the hawk headed for the tree line and kept going. The hen returned to her babies. When they went back into the pines, the babies were very close to their mother’s feet. Wish you could have seen it. Karen Davis, Ph.D. is the founder and president of United Poultry Concerns, a nonprofit organization that promotes the compassionate and respectful treatment of domestic fowl (www.upc-online.org). She is the author of More Than a Meal: The Turkey in History, Myth, Ritual, and Reality. Karen’s essay, The Turkey in History, is in the forthcoming Encyclopedia of Animals and Humans edited by Marc Bekoff and Janette Nystrom (Greenwood).